17 year old Charlie Simms is attending a New Hampshire exclusive private Baird Prep School on a full scholarship. To earn money for a plane trip home to Oregon at Christmas, he innocently takes a job over Thanksgiving weekend, looking after a verbally abusive, head-strong, blind, newly retired Lieutenant Colonel Frank Slade, little knowing what adventure he was in for as the Lieutenant Colonel turns out to be quite a handful, with plans of his own in the Big Apple. The cast includes: Al Pacino, Chris O'Donnell, James Rebhorn, Gabrielle Anwar, Philip Seymour, Richard Venture, Rochelle Oliver, Bradley Witford, Gene Canfield, Nicholas Sadler, Matt Smith, Todd Louiso, Francis Conroy, and June Squibb. Directed by Martin Brest. 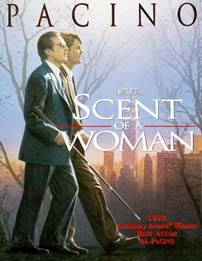 The screenplay was written by Bo Goldman, based on the novel by Giovanni Arpino.